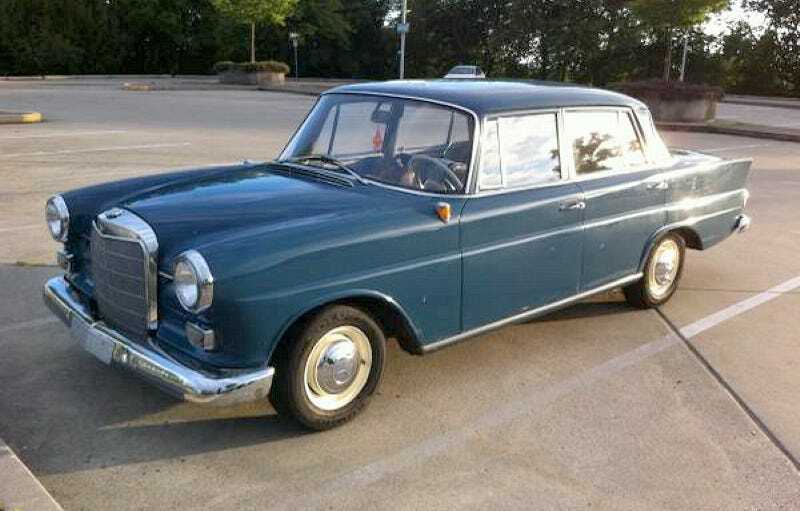 Can This 1963 Mercedes 190D Command $4,000? Getting a D in school is bad, but getting a D in today's Nice Price or Crack Pipe old-school Mercedes might just be a good thing. That is of course, if its price rates a passing grade. As Neil Young always likes to remind us, rust never sleeps. We all heard ol' Neil put it down, and likewise you put down yesterday's 1994 Centurion 4-door Bronco in a 67% Crack Pipe loss due to its age and the fact that rust is currently headlining that custom truck's bill. Would You Drop $4,500 For A 4-Door Bronco? That big Ford was moved by a massive diesel motor, a form of internal combustion engine that has long been popularized by Mercedes Benz. That German maker favored it for its economy, and its ability to wake the neighbors with its unique can of marbles sound. In the sixties, gas prices in America hovered around $0.30 a gallon, or about what you might pay today to accidentally send that drunken selfie to your mom if you don't have one of those fancy cell phone plans. With gas so cheap, big was popular here in the States; big highways, big cars, and big engines, all of which were the preferred way to drag our big American asses from place to place. Perhaps that's why in 1963, Cadillac sold nearly 163,000 cars here in the U.S.. Mercedes Benz on the other hand sold a mere pittance of their compact W110 with its modest diesel engine. Of course in '63 the only reason you'd buy a diesel was as an excuse to get fuel at a truck stop, and the main reason a car-driver wanted to go to a truck stop was for the truck stop hookers. I'm not saying that, back in the day, this 1963 190D Heckflosse emboldened infidelity, but then again, I'm not saying it didn't. The W110 was originally introduced in 1961 as a lower-content 4-cylinder version of the 6-pot W111. The four cylinder cars were 145-mm shorter in the nose area and carried a number of cost-cutting measures when compared to their bigger, more expensive brethren. You can see some of those cost-cuts on this seemingly well-preserved example, including the deletion of chrome trim around the door windows, while on the inside the door handles and trim are dissimilar and a little more low-rent in the 190. It still has that wonderful vertical instrument binnacle however, and is as classy as hell. This being a D, and after all who doesn't love the D, the engine is Mercedes' 55-horse OM621 four, which offers 1,988-ccs and a 29 second time for a run from zero to 100KM/H. Behind that on this car is a column-shifted manual. One other mechanical specification of note is the rear suspension which is a funky single jointed swing axle. The bodywork looks well taken care of although the teal paint seems - in the photos at least - to be in need of a good buff-out, and there look to be some issues on the driver's side. All the trim appears intact with the notable exceptions of the three-pointed star radiator mascot and turn indicator-mounted side mirror. Out back the American-influenced rear (hence Heckflosse or Fin-Tail) has not aged as well as has the cars' pontoon fender predecessors, but it's still stately and as Benz-y as ever. Mileage is said to be 81,000 or 181… or 581… the current owner isn't sure. He does say that's Aircared and insured, however. He also says that it's fun to drive, which I guess is relative. If that's the sort of fun someone is seeking, do you think that four grand is a fair price to find it? That's the asking price, and now I'd like you to weigh in on whether that seems like a deal or not. 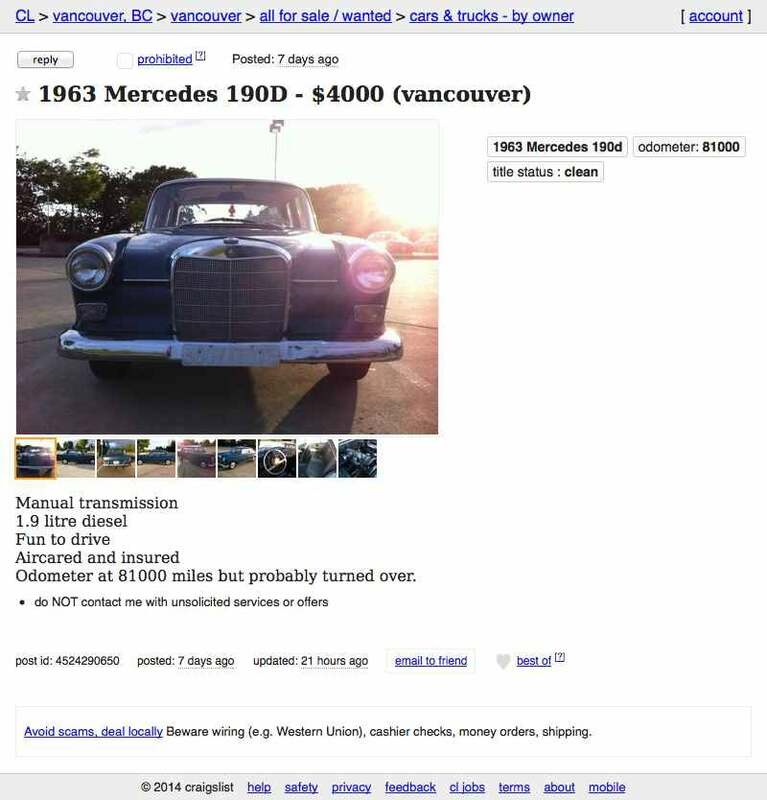 What do you think, is $4,000 a fair price for this old diesel Benz even if it's glacially slow? Or, do you think that asking makes it not worth the wait? H/T to usingthegasyourhybridissaving for the hookup!